Bioshock Infinite game is going to be not only mysterious and beautiful, but also will have a lot of action. Previously the developers showed a lot of different Bioshock Infinite trailers, but they told us basically about the plot of the game. Finally we got new video that shows the battles, shots and fantastic powers of our heroes. This combat Bioshock Infinite trailer was revealed a few hours ago. Here we can see the protagonist - Booker, - the girl he needs to save and a lot of hazards on their way. 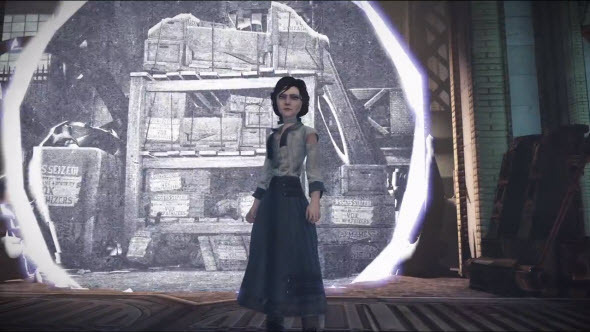 It is interesting that according to Bioshock Infinite trailer Elizabeth won't be vulnerable victim, she will help Booker to survive in beautiful, but very dangerous Columbia. By the way, she has special powers, so the combat in new Bioshock Infinite game is going to be very hot and spectacular.